Q1) I’m so excited for your new program! When does it launch? Q2) When can you sign up and how? In the next few weeks we will be releasing a link to our website (Love Living Lean) that will help you sign up and from there you will get a log in and passcode. This will allow you access to a platform where you can easily access all the information, meal plans, workouts, videos, support groups etc necessary for your journey. Q3) How much is your program? Q4) Will there be a discount if you pay for the full 12 weeks up front? Yes! We would LOVE to reward you guys to committing to the full 12 weeks up front! Early bird discount (Oct 14th-21st) = 2 weeks free! After the early bird ends and from Oct 22nd-Nov 4th = 2 weeks free! Q5) Is your 12 week program just Nutrition or fitness plans as well? It’s both! As you will see from the above question, you can choose to just do the nutrition plans or you can choose both the nutrition and fitness plans too if you prefer. Obviously you will lose more weight (and build more muscle) if you are following both our nutrition and fitness plans together (as they are designed to compliment each other) but you will still lose weight and feel FAB with just our nutrition plan too but we urge you to do your own workouts/exercise to compliment the nutrition plan if you are able to (you’ll get maximum benefit from exercising too). Q6) I love the sound of your program, can you tell me more about how it’s structured? I sure can! As you will see from the above questions, once you sign up, you will receive a log in to access our private website and Facebook community where you will be able to download your new meal plan (+fitness plan if you choose) every week. On this platform, Ange and Leanne will also be uploading exclusive videos each week that talk you through a huge range of topics so you learn about health and nutrition too (not just blindly follow the plan). The meal plans are very flexible and will give plenty of options every meal! In fact, you will get at least 3 options and recipes for every meal and snack. In general, we aim to give you one quick ‘on the go’ option, one hot option and one cooler option. Q7) I love the sound of your program, but I am really motivated to lose weight particularly as I my GP recommended weight loss to help my condition. Can I expect to lose weight following your program? Hi there! It’s great that you are motivated to lose weight to improve your health and I am confident the program (if adhered to) will help you lose weight. Our program is based around teaching you to nourish your body and fuel your activity and an amazing bonus that we see as a result is weight loss. The reason we are not identifying this as a typical 12 Week “Challenge” is that people tend to severely restrict on these types of Challenges and then as a consequence regain the weight (if not more!) after the end date. Our major difference (and why we’re so successful) is that our program supports sustainable weight loss and life-long healthy nutritional habits to empower you well beyond the 12-week time frame. The online community we will build within the program will not only give you expert knowledge every week but also provide the support and constant motivation to allow for nothing but success. We can’t wait for you to join us! Q8) Hi ladies, I’m super keen on your upcoming 12 week program however I really struggle with my nutrition and yo-yo weight over the last year. I follow your pages and absolutely love everything you post about but I’m worried as I’m going on holidays at the start of your program whether I can still do it. Am I able start the program in week 3 when I get back? Our program was literally designed for women like you that are sick and tired of restricted “challenges” and “weight loss programs” without sustainable results which get you stuck in a ‘dieting’ mentality which is hard to break and never allows you the freedom to eat the foods you love. Our LOVE LIVING LEAN program was designed from a need to stop women from dieting and restricting and allow them to start fuelling their bodies with nourishing whole foods every day. This program is launching over the holiday period specifically because we want to show YOU how it is possible to still go on holidays, have great weekends and enjoy special events without restricting or obsessing about foods, without missing out and without losing all control and falling off the wagon. In regards to your question about sign up, we will be offering sign ups before the program launches and the first few days into the program only. Once the first week is over, the sign up will close as the content is built on every week so we can’t have people jumping in at week 3 and expecting the same results. As the price point is SO cheap, we are encouraging everyone to sign up from week 1 so you still have access to all the content even if you need to go on holidays for a week or two. Also, as mentioned above, our program is designed so that you CAN do it while you are on holidays and we will assist you to choose your options during this time and fuel your body the right way so you can feel amazing, nourished and happy while you are on holidays! This program was designed to literally allow you to still lose weight and feel amazing on holidays. Q9) I’m sick of doing 6-12 week programs and re-gaining the weight at the end. You say your program is different, please tell me how as I love your work and believe you can help me once and for all! This is a great question and EXACTLY the reason we developed the LOVE LIVING LEAN 12 week program as we saw SO MANY women doing these strict 12 week programs where the calories we far too low (1000-1200 calories for 12 weeks!) It literally broke our hearts. Our nutrition guide starts much higher with a focus on an abundance of nutrients! Now don’t think you won’t get results, In our experience, if you aren’t new to dieting then we need a “metabolic reset” where we give your body an environment that offers more food to reset your current eating pattern and get you out of the dieting mentality. Other plans also take out any ‘bad’ foods and have a whole list of things you ‘cant’ eat. Our plan specifically encompasses freedom for you to enjoy your favourite foods (such as chocolate, wine or chips) so you never feel deprived or like you’re missing out. We want to create a SUSTAINABLE lifestyle so even when the 12 week program is over, you can maintain this way of eating using all the delicious recipes we’ve provided you and all the tips and tricks we’ve shown along the way to maintain it FOREVER! This is not a diet – we are building a LIFESTYLE and that starts with learning to fuel your body, rather than restrict it. Q10) I want to do your new 12 week program so bad as I love everything you do and know you can help me but I’m scared as I realise it runs over Christmas and new year… please tell me you’re letting us have a glass or two of champagne?! YES OF COURSE! I’ve answered this above but there will be plenty of flexibly to enjoy your favourite foods in our meal plans! NOTHING is off limits! Of course we are not encouraging you to eat junk constantly or over consume alcohol but we strongly believe in a holistic healthy lifestyle which is maintainable forever so yes there will be space for wine and even better – you get the entire of Christmas Day off to enjoy with your family and friends but we encourage you to get straight back to your nourishing meals in the plan the very next day. Christmas is a wonderful day to celebrate but I think a lot of people forget it’s one day, not an entire month. We will be there doing it with you guys every step of the way to provide continued support and motivation on the website and also within our closed FB group where you can ask us any questions any time of the day. The meal pans are filled with a nourishing abundance of good food so you’ll never feel deprived or like you’re missing out and you won’t even want to go off the meal plans once you realise how amazing a well-nourished body can feel! Q11) Will there be enough variety in your meal plans? I don’t eat eggs or avocado but every program I do has them in there! Please tell me you’ll have options with out them! Yes there will be! We can 100% accommodate for things you LOVE and things you would rather skip! The meal plans are very flexible to personal preference and will give plenty of options every meal! In fact, you will get at least 3 options and recipes for every meal and snack. So that’s 3 different breakfast options to choose from, 3 different morning tea options and we will aim to rotate these very frequently so you don’t get bored! There will be eggs and avocado in the program but also a whole host of alternatives so you can totally chose to leave them out and still hit all your needs! Q12) Can your program cater for vegetarians? Yes most definitely! We have a plant-based approach to our nutrition plans, so this means there will be loads of vegetarian options. You can choose to have fish, eggs and dairy but omit animal-based flesh and still follow the program without the need of supplements (unless you have a clinical deficiency!). The program will have an interchangeable protein list so you just choose the vegetarian-based proteins – EASY! Q13) Can your program cater for vegans? This program will not cater specifically for vegans as in our experience we need to be aware specifically your level of training and past clinical history before we feel confident we can professionally prescribe you a plan that won’t require supplementation. We can safely cater for vegetarians but unfortunately vegan nutrition requires some more personal one on one prescription to get right for you! We intend on offering specific meal plans at the end of the program should you chose to decide this as a service in future. We apologise for not being able to cater for this in this program but we want to be confident in our ability to lead you professionally and it’s just not something we can’t do with a generic vegan plan without a full nutrition assessment, we hope you understand! Q14) I’m 55 years young but love your balanced approach to eating! Can I still take part? Yes of course you can! The foods that will be within the meal plan are completely appropriate for all ages! We are using wholefoods to fuel our bodies, no shakes, meal replacements or pills. You can choose to do just the nutrition component or the nutrition and fitness together (however the fitness program is more gym/weights based but appropriate for anyone with a basic background in strength training). You will get amazing results from just the nutrition program or both including the fitness program too. Q15) Is your 12 week program appropriate for pregnant women and/ or breastfeeding mums? Definitely! It’s whole-food based and provides an abundance of nutrients – something we believe mums struggle with taking care of families first!! There will however come a time when we start to reduce total energy in order to accommodate for Christmas and elicit a safe and sustainable fat-loss, but we will notify you at what part of the program this occurs and we will suggest that you stay on the first 4 weeks of the nutrition program and not adopt the plans following. Pregnancy is always personal as this may change your desire to eat certain foods and you might have some clinical considerations that we might not be able to address in the program (such as low iron or gestational diabetes). In this case, if we wouldn’t recommend partaking in the program if you are pregnant with clinical concerns. For breastfeeding mums this will be completely fine unless your baby has a cow protein/soy intolerance then you will have to substitute for this under professional dietary guidance. It is virtually impossible to ascertain energy needs for a breastfeeding mum as your baby/sleep will dictate this! We will have options to upscale your nutrition if you feel you are hungrier than normal at certain times so there is definitely flexibility in the meal plans but we will not be suggesting to take the “leaner” approach in the final weeks. From a whole food variety perspective though, if all mum’s ate the way we will be suggesting there is no reason health should not thrive!! Q16) I have hypothyroidism, can I still take part in your program? Absolutely! We just suggest that your Hypothyroidism is something that needs to be managed with your doctor in relation to adhering to your prescribed medication. Our program is all about healthy eating relation to the current guidelines and our experience in fat loss science, so in conjunction with your medication and keeping a regular check on your bloods through your GP, there is no reason why you shouldn’t be able to follow our nutrition guidance. The program is not designed however to CURE/TREAT hypothyroidism. Q17) I have PCOS, will your program be ok for me to do? Our program is all about healthy eating to support an active lifestyle. The current evidence in relation to PCOS suggests if you have a tendency toward insulin resistance that this needs to be addressed and managed through collaboration with your GP and carbohydrates need to be moderated at certain times depending on your activity level. That said, there is no harm done from eating a healthy nutritious diet so it’s a perfect starting point especially if you are not currently eating great, our program however cannot cater from a fully personalised approach in relation to periodising carbohydrate particularly if you choose not to do the exercise program also as this helps insulin sensitivity. We intend on offering specific meal plans at the end of the program should you chose to decide this as a service in future. We apologise for not being able to cater for this specifically in program but we want to be confident in our ability to lead you professionally and it’s just not something we can do with a large amount of people without a full nutrition assessment, we hope you understand! Q18) I’m a 45 year old overweight guy, I notice you keep saying ladies but can men do your 12 week challenge too? Our target market is females this round as the base plan is going to be Leanne doing it! Males have slightly higher needs and we will also be focusing on the female body, hormones and fat loss as it pertains to women. If we have adequate interest in men doing the program, we can definitely accommodate for this next as the program develops but unfortunately for the pilot program our focus will be on the ladies, sorry! Just a side note however: there is absolutely no reason why you ladies can’t feed these nourishing meals to your husbands, partners, son etc. as the recipes are REAL food (men just generally require more calories than females and slightly different macros therefore the meal plans we are providing in this challenge won’t be appropriate for active males). You can definitely follow our healthy eating principles and remove the training nutrition to accommodate for lesser activity! Your results might not be as dramatic but there is no better time to start eating well when you can’t exercise as much so you most definitely can still take part and see a benefit we just can’t guarantee maximal results if you can’t manage the exercise component. Q20) I don’t have access to your gym as I can’t afford it, can I still do the fitness component at home or is it only gym based? We recommend you join a gym to execute the program (even a cheaper 24hr gym), or a more studio-based training facility or Crossfit box that has more freedom and equipment than a specific program based gym (e.g. F45 or HIIT) to maximise your results. 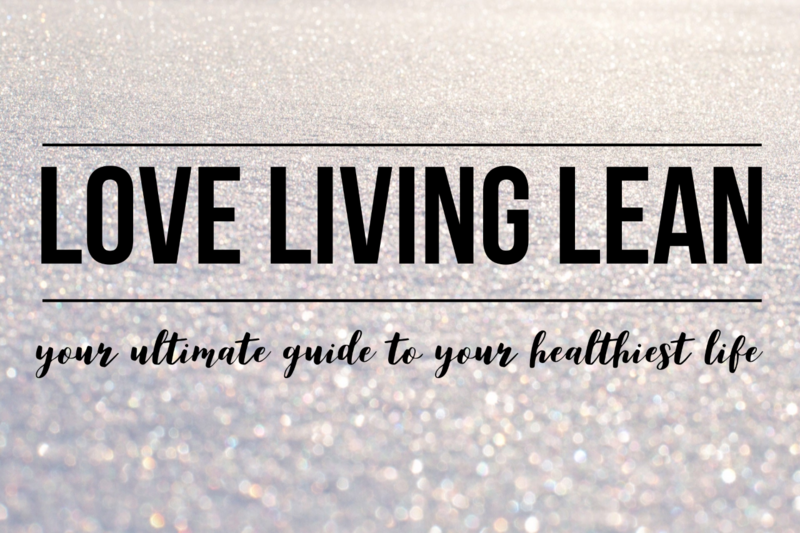 Although things like high intensity training or other forms of cardio are good for general exercise, the focus of the ‘LOVE LIVING LEAN’ program is to improve muscle and tone. The exercise program will be designed for a gym based facility as Leanne’s followers have told her they want to look like her ie. They want to focus on increasing muscle mass which requires higher resistance than body weight/stretch bands/ dumbbells or your typical HIIIT class. You effectively can lose more body fat as a result of higher intensity training but Leanne’s followers have told her they want a focus on being stronger, leaner and fitter for everyday life. The training is programmed using things like squat racks, leg press machines, chin up bars and other equipment (not typically found in a home gym) for muscle adaptation and synthesis. Not only do we want to make you leaner and lose body fat but we also want to make you stronger for everyday life activities. The other very important point why we believe you need access to a gym is, adherence. This basically means you’ll enjoy the program more and will be more likely to stick with it due to the variety and options. Some people who sign up for the fitness component won’t have a lot of resistance training behind them therefore being in a gym with trainers around to correct your form is also very important. The 12 week fitness program will have a huge range of exercises needing various types of equipment and this variety prevents boredom, variety keeps adherence & making an appointment with an environment that supports your goals is massive win when you surround yourself with like-minded people! Please note however that the fitness part of the program is not compulsory, we just recommend it for the best results in terms of ‘LOVE LIVING LEAN’. If you choose not to do it (as you are already doing your own exercise) that is totally ok as well and you will get the cheaper nutrition only price point where you will still see results from the nutrition program only (we cannot guarantee exact results however as our nutrition program is matched with our fitness program but the private FB group will allow you to ask questions around your training too and we can assist you with the nutrition plan to match). Q21) I already do lots of exercise (running, yoga and netball), can I do just the nutrition component and not the fitness plan too? Absolutely! Our nutrition is devised to compliment an active lifestyle – and that is whatever you enjoy in relation to movement! We have a cheaper price point for doing just the nutrition component without the exercise program we just can’t guarantee maximal results (ie. muscle gains) if you chose to do something slightly different with your exercise but how awesome you are already committed to being active – your nutrition plan should still see your sport performance thrive regardless! Q22) What type of program should I expect if I choose the “program” option? For maximal results (with longevity in mind) we believe 3 to 4 days per week of resistance training is optimal. The program will have specific exercises, sets and repetitions and structure which has been carefully designed for best results, progressions, regressions and safety. Each exercise will come with video tutorials via an app that you will download with a specific code for access to the programming (the app is free to download). Preparation (5-10min) – Mobility and specific activation for the workout of the day. Strength (10-15min) – The focus here is to make you structurally strong and increase muscle activation with sets ranging from 3 – 5 and reps ranging from 5 – 15. Supplementary Strength (10mins) – During this section of the workout we are aiming to “iron out” any left to right or front to back muscle imbalances by using single leg/arm exercises that challenges stability in each side. Also there will be core and anti-rotational core (abs and obliques) movements in this section. Conditioner/Finisher (10-15min) – The goal in the section is to get you nice and sweaty which will increase your heart rate and improve your fitness and conditioning. A general conditioner will be 3-5 exercises with target reps and rounds to achieve in a certain time period. On top of this, it is suggested you complete another 1-2 sessions of exercise per week in whatever mode you enjoy – this could be walking around your area, cycling with your kids or hiking a mountain if that’s what you enjoy! Expect to put aside 5 hours of training per week as this is what is required to achieve great health and a lean figure (note: this sounds like a lot but it’s really only 5 x 1 hour sessions a week which EVERY person should be doing for optimum health and wellness). Q23) You said we’ll get support every week from yourself and Ange, can you please tell me more. I’m excited as I need this weekly support & motivation! You guys sure will! Once you sign up, you’ll be able to access our private Facebook group for daily support. This is a community of women all working towards the same value – nourishing our bodies with an abundance of good food to thrive! You can ask us any types of questions within this group and we will get back to you with answers. If we get the same questions we will film answers to them on live videos so you guys can tune in and learn at the same time. Our program is different as we are teaching you, not just showing you! The Facebook group will not only provide daily support from us, it will also provide support and motivation from your fellow participants! Q24) I love that you’ve teamed up with another lady but please tell me more about her, she sounded great on your video! Angie Clark holds a degree in Exercise Physiology and a Masters in Nutrition & Dietetics. She is an Accredited Sports Dietitian with a speciality in elite physique transformation and has work directly with celebrity transformations and many athletes entering in the sports of natural body building, fitness, figure and bikini modelling contests. She is involved extensively in meal plan development, sports nutrition presentations and performance cooking workshops for numerous Challenges in Brisbane and internationally and most recently Angie has develop and facilitate Sports Dietitian’s Australia recent Masterclass in Physique Management and Assessment, educating her sports dietetic peers on fat loss science and guest lecturing for University Master’s Nutrition and Exercise Science students. She is the founder and director of iPerformance Nutrition – a successful sports dietetic private practice and co-owner of the functional training facility Perform360 in Brisbane, Australia. She comes with 15 years of experience but best of all she’s also an active Mum of 2 boys and loves plant-based whole food nutrition and seeing others achieve the ripple effect of great health! You guys know I would only team up with someone I fully trust and that can enhance your lives as she will mine! I trust her fully – which is why I’m doing it with you all because I’m 100% confident in her skills and I only want to bring you guys the best! Q25) How is your 12 week program different to your new e book on healing your relationship with food? It’s actually very similar however the e-book addresses all the emotional/ mental aspects to eating (which we touch on briefly throughout the 12 week program but the e book will go into much much much more depth!) Head over to my shop page here to have a read about what it truly encompasses. The ebook teaches you to heal your body and relationship with food. You can use it in conjunction with the 12 week program or if you’re someone who is really struggling with the emotional/mental aspect to eating, you can work through the e book first and join our program in 2019 (if you feel read). If you have a clinically diagnosed eating disorder, I feel the book would be a brilliant tool to assist you in your journey to recovery (it is not a tool to use alone in your recovery – you must still work with your professional team; your specialist dietitian and psychologist too). Have a read of the description and the example pages on my website to learn more about how this e book will help you heal your body and relationship with food FOREVER. Click here to read more. Hi Leanne… just wondering what my weekly food shop on your plan is likely to cost? I’m a single mum on a tight budget and can’t afford to buy lots of expensive ingredients like some plans have. Is the nutrition plan something that my whole family could follow (husband, young girl and preschool boy). We have a strong family rule that, especially dinners, we eat the same meal together as a family at the dinner table. But I am super keen to learn more about nutrition and ensure my family is eating nutritionally well. Thanks. You mentioned that you need access to a gym for the workouts, what type of exercises are in a typical workout? Do you have an example? I really need help with fitness and exercise ideas and I am trying to decide on a gym. I can’t wait to start your program!! You guys are amazing! Hi lovely, thanks so much for your message! As the program is so cheap – we obviously can’t provide individualised meal plans for everyone but the base plan we are using is 100% adaptable for your family & kids – you’ll just need to adjust portion sizes based on their age etc. (you can defiantly feed them our main meals however). Your activity sounds great! As our program is focused on building a strong, lean body (which is what women ask me all the time!) – it will be specifically weights based 4-5 days a week so if you’re looking to build muscle/ tone then we recommend our gym program too for maximal results but if your focus is generally weight loss/ healthy lifestyle then your current exercise regimen sounds more than ok to get some amazing results!